The fact that the new Limited Edition Bulova Accutron 96B159 has already hit the mark, being rich in meaning. Many collectors have turned to his research, and there are many factors that have contributed to this success. Bulova is perhaps the only house to watch the panorama can count on a mythical character of Music, Art and Finance, as a testimonial. The founder of the Virgin, the record icon of the golden age of vinyl, Charles Branson, not only lends the face of the campaigns of the brand of the tuning fork, but even marries the “cause” by signing a watch produced in a limited series. Made of titanium, Bulova Accutron 96B159, shows off her precious movement ETA 2893-2 with automatic winding, whose oscillating weight the abbreviation of British tycoon. Particularly feisty, but an innate elegance as its ambassador, this clock could not have aesthetic characteristics of class. From the technical point of view speaks for itself GMT monolancetta the modeled half-moon at the top, red in color, which indicates the time of 24 hours. 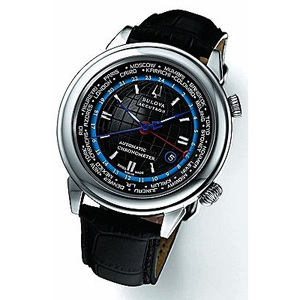 The dial, reminiscent of the machined clous de Paris but larger tiles to compose a stylized world, is surrounded by a ring which contains the names of major cities around the globe, and is driven by an outer ring. About crowns, it is worth highlighting the shape vaguely retro and just oversized in harmony aesthetic elegance that strikes. Only 500 lucky can possess this unique model, with COSC chronometer certificate. And strictly numbered. Also on the package, obviously dedicated, Sir Charles Branson wanted to affix his seal in the form of signature, which witnesses the ideal symbiosis with this new creation from Bulova Accutron. It should be noted that in the United States of America, Bulova has risen to the level of legendary, having been the watch that has accompanied some of the most symbolic phases of American life. And ‘who invented the clock in fact the time signal in the ’30s, and with the explosion of Accutron 60s has reached unimaginable honors, becoming the gift of the President of the United States of America and the equipping’ Air Force One, the presidential plane. E ‘is therefore logical that a roll of this type could not go unnoticed, even if the speed of the collectors may be surprised and precede all.